So Mitt Romney won what the Washington Post calls a “decisive victory” in Florida yesterday, and while the Republican presidential primary isn’t quite over (a majority of the votes still went to his three remaining rivals, donations keep coming in to Newt Gingrich especially), the former Massachusetts governor is now well-positioned to lock up the nomination on “Super Tuesday,” March 6, where people in eleven states cast their votes. If Romney becomes the candidate, a closer look at his current campaign can help us understand how he will fight the general election. In past cycles, most recently of course in 2008, the way candidates fought their primary gave many clues to how they ended up fighting the general election—in terms of their stage persona and their main message, yes, but also in terms of how their effort was organized in a more practical sense. Building a campaign organization, mobilizing allies around it, and recruiting thousands of low-level staffers and volunteers is not something that is easily done overnight, and the wider campaign build around a particular candidacy will have its own internal inertia and idiosyncrasies, traits that often reflect decisions made months or even years before Election Day on the basis of a combination of received wisdom and the priorities of individual people involved. Once things are done in a particular way, unless something is clearly dysfunctional, intense time pressure and the multiple concerns always calling for the attention of the candidate and senior staff generally mean they continue to be done that way. How will his campaign work with the volunteers who do come? 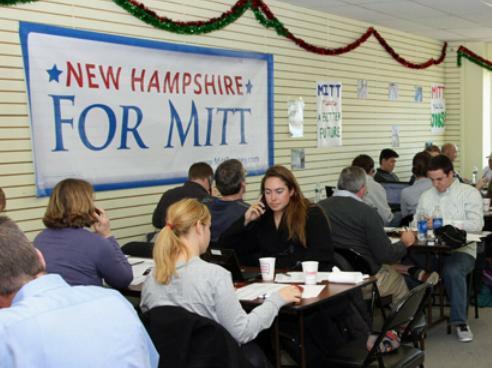 Throughout the primary, Romney’s campaign has made a priority of having a physical presence on the ground, opening campaign offices and posting contact details in relevant states to make sure people have somewhere to go. His campaign has also embraced the various online-enabled forms of “distributed phone banking” pioneered by MoveOn and others, where supporters can log on via a campaign website and make calls directly to target voters in relevant states from their own smart phone or computer. In both cases, the campaign has quite sensibly been platform agnostic, deciding to make as many different forms of engagement possible and to meet potential volunteers where ever they may come from. In both cases, the campaign has also prioritized channelling people’s time and energy into phone banking, a demonstrably effective way of trying to sway people and turn out voters. At a general level, coverage of the primary will often stress how Romney’s campaign is well-funded and professionally run. But money and hard-nosed expertise is not all an effective campaign needs. The interface between campaign staffers in it to win it and volunteers with a much wider and mixed set of motivations can generate considerable friction and requires mutual empathy and a practical sense for making people work together that is sometimes lacking from political campaigns. And it matters. Volunteer mobilization and the translation of volunteers’ time and effort into instrumentally useful activities may sound dry and dull in comparison to the more immediately exciting speculation about what the next campaign advertisement will highlight or how the candidate will perform in the next debate. But both are crucial parts of a competitive campaign and shape how it is possible for ordinary people to take part in the electoral process beyond casting their vote. That’s why it will be interesting to see how the eventual Republican nominee ends up organizing his effort to challenge Obama’s re-election campaign. This entry was posted in 2012 Republican primaries, 2012 US elections, Ground wars, Political campaigns and tagged mitt romney, newt gingrich, political campaigns, volunteers. Bookmark the permalink.